It's gotten worse. It's been decades since service manuals have been routinely included with products. Between greed on the part of the sellers and their legitimate concern that for reasons of complexity real people can't repair their products, the manuals have disappeared. And yet worse: Even the operating/user manuals have grown less helpful as they become more a compendium of safety cautions and warnings than they are a readable explanation of how to employ the product(s) to which they refer. The end (perhaps) of this disturbing trend is when I "went solar." I installed solar power at my house and liked it so much that I arranged to have it installed at my place of striving. Involved in these installations has been equipment from four different manufacturers. Each one, presumably independently, has decided that my hardware has to send my solar data to its servers to be massaged before I can get it to my computer. Read that last sentence again: MY hardware. MY solar data. MY computer. And yet, for no valid reason that I can divine, all the data generated by the systems seems to make a round-trip to the manufacturers' facilities before I can read or use it. Why does this vex me so? Not for reasons of privacy, to be sure. I don't care if they know that the sun is shining in Sedona or how many kilowatt hours of energy goes from the grid to my house. I'm vexed because the gratuitous and deliberate inefficiency, while not unduly problematic during normal times, will become dangerous during times of emergency. The main arguments for solar power include the environmental since it is "renewable" and carbon-free, and economic, in that it can save real money. I've hashed and rehashed the economics, and shall do so again after I've had my Tesla Powerwall batteries and collected data for a year, coming up in March. But a major consideration for me and for others living in semi-rural areas is the power security solar provides, since it is or can be independent of "the grid." I have a grid-connected system. But with small changes and entirely under my control, I can go off-grid in case of emergency. What emergency? Who knows? But if the grid goes down, what about the internet itself? It is just as fragile as the power system, and why would anyone want to be dependent upon an internet connection for his electricity? Tigo Energy, which makes "optimizers" for each of my solar panels that allow them to operate independently even if one or more is in shadow. SMA Solar Technology AG which manufactures the the solar inverters for my home system. Tesla which makes the Powerwall batteries that charge during sunlight hours and provide backup power. Enphase which provides the microinverters that interface individual solar panels to the grid, and, as with the Tigo optimizers, allow them to function independently if there are shadows on some. The good news, at least thus far, is that all of their hardware has been surprisingly durable and reliable. The bad news is that they are all, every company-jack of them, meddlesome and officious with respect to the data created by the hardware that I purchased from them. Tigo provides a wireless connection from each of their optimizers to their local "gateway" which then connects via the internet to the mothership which massages the information into a display which I can only view by logging into their web site. SMA charges extra for an ethernet connection to their inverters, which only connects to their facility in Germany. Every day they email me a report of how much power was generated each hour of the previous day. Tesla has an app that shows on a continuing basis how much power is being generated by the solar system and sent to/from the house, grid, and batteries. Although this data is visible locally and in real time, there's no way to download or log the data. Worse, there's no way to control either the power distribution or how and when the battery is charged without communicating, via the proprietary app and the internet, with Tesla. Enphase, as does Tigo, reads the data from the microinverters, sends it to their facility where it is logged and massaged, and again can only be viewed by logging into their web site. Four italicized phrases, four potential single-point failures or, if not failures, difficulties in diagnosing functionality. And four examples of unnecessary (or optional) meddling in my ability to manage, understand, and log data from my own system. *I'm running out of comparatives here. 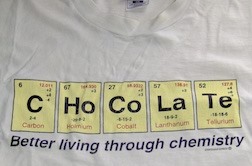 It being the International Year of the Periodic Table, what better shirt to enhance the celebration?